The University of Florida men’s basketball team defeated the Webber International Warriors, 104-53, on Monday night at the Stephen C. O’Connell Center in their final tune-up for the 2009-10 season. 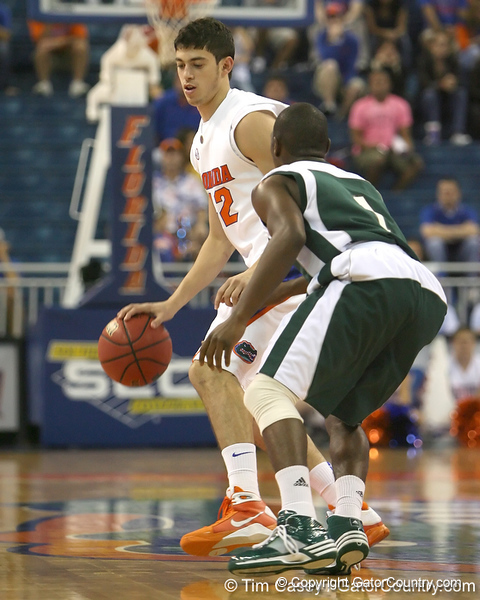 The Gators were led by their freshmen and sophomores, who combined to score 74 points. Freshman Kenny Boynton led five Gators in double figures with a game-high 25 points, marking the first time since 2004 that a Gator player has scored 20 or more points in both exhibition games. After Webber International jumped out to an early 15-11 lead at the first media timeout, the Orange and Blue stormed back to finish the first half on a 43-8 run. UF shot 56.8 percent in the first half and forced 15 Warrior turnovers. Boynton finished with five three-pointers for the second-straight game and made 8-of-12 attempts from the free-throw line. Sophomore guard Ray Shipman finished with 16 points and grabbed five rebounds. Junior Chandler Parsons led all players with nine rebounds and also chipped in 12 points. Sophomore Kenny Kadji scored 11 points and had eight rebounds in just 19 minutes off the bench. Sophomore point guard Erving Walker assisted on nine baskets, giving him 18 total in preseason action, and finished with 12 points of his own. Freshman forward Erik Murphy played solid off the bench with eight points, four rebounds and a game-high six steals.